In the ever-changing landscape of digital marketing, it can be hard to truly examine what works—and more importantly, what doesn’t. A great place to start is by looking at the brands at the forefront of the digital marketing world and analyze what worked for them. There is no need to reinvent the wheel. However, there is a lot of misinformation and poorly executed digital marketing strategies out there. It can be hard, but not impossible, to execute a digital marketing strategy that connects with your customer, increases your brand awareness, and adds money to your bottom line. 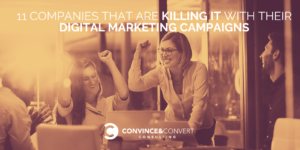 So, to help you get started, we’ve put together a list of the top 11 companies we believe have implemented a dynamic digital marketing strategy that increased company ROI and added value to customers. The companies below are not just doing digital marketing—they are creating experiences and content that captivate their audiences and bring outstanding brand awareness. They are the best. We have also added a bonus section at the bottom of this post of four companies that are absolutely killing the social media world. Social media campaigns are part of digital marketing, of course, but these brands are doing such an impressive job that we had to spotlight them. Seeing is believing, so without further ado, here are our favorite eleven companies that are doing digital marketing right, and four social superstar companions. Zappos, a leader in online shoe commerce, sets the gold standard for online customer care. In fact, their CEO wrote the book on it. It’s no shock that they have a stellar digital strategy. Not only does Zappos provide a 365-day money back guarantee, but they also have free shipping both ways as well, should consumers decide to return or exchange products purchased on the site. As a result, Zappos doesn’t have to work hard to market its online presence—its policies are so appealing to consumers that shoppers are eager to sing the company’s praises to one another in a completely organic (and viral) fashion. Of course, Zappos does still invest heavily in online marketing, and its social media campaigns shouldn’t be missed! Notice how they focus on what the customer wants and needs, not on what they want the customer to want or need. This is a key part to any effective digital strategy. Listen to your audience and plan accordingly. The Lesson: Content marketing is the way of the future, but it must be managed appropriately to be effective. Online content marketing campaigns should strive to produce measurable results in proportion to the resources committed to them. Plenty of companies talk a big game about “the communities” they’re creating online and the inherent value of the “online conversation.” However, very few actually create any community of value. Far from being all talk and no game, American Express puts its money where its mouth is by leveraging the value provided by industry experts on its Open Forum website. 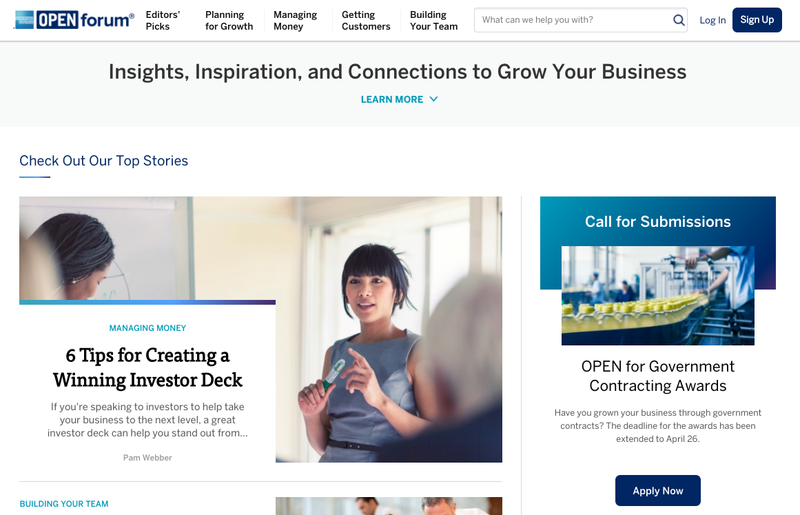 Open Forum is a collaborative website, on which American Express invites guest authors from a variety of sectors to share their business knowledge and wisdom. The result is a content-rich mega-site that’s popular with the search engines, all created without American Express needing to shell out cash to content contributors. The Lesson: The creator of your content does not need to be you. Find industry leaders that produce great content, and ask them to write a couple articles on your blog. It will build their audience and your traffic, as long as the content provides value. Good content marketing strategies draw on a range of user-generated sources to both grow online communities and minimize financial investment. Entering the crowded personal finance niche (or any popular niche) is a daunting task for any new startup, but the approach that financial tracking tool Mint took proves that it’s possible to stand out in a crowd through well-executed online marketing strategies. 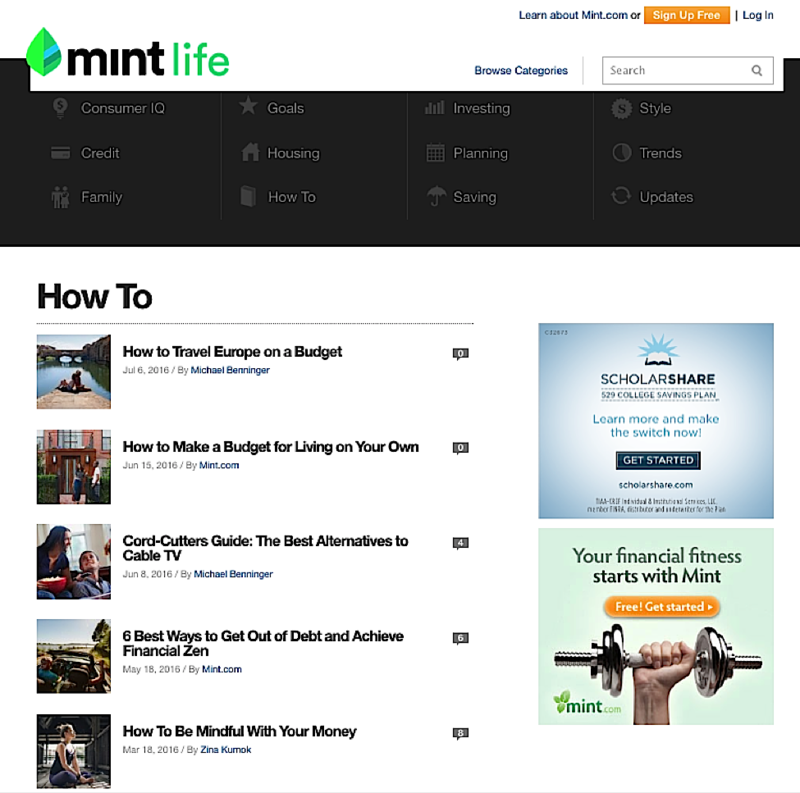 Although the company was a relative unknown amongst its more popular predecessors, Mint committed to a digital strategy publishing hundreds of high-quality content pieces, from informative blog posts to viral, attention-grabbing infographics (like A Dude’s Guide to Not Going Broke during Wedding Season) to grow their business. As a result of Mint’s digital marketing efforts, the tool gained a massive online following before being sold to Intuit for a whopping $170 million. In a podcast on Growth Everywhere, Neil Patel discussed why he spends up to $30,000 dollars on content and gives it away for free, and how it is all worth it in the end. The Lesson: Investing in content marketing often requires significant amounts of time and money, but committing to content production and high-quality standards can build substantial market attention in a short period of time. Shaving is the epitome of a boring routine, right? 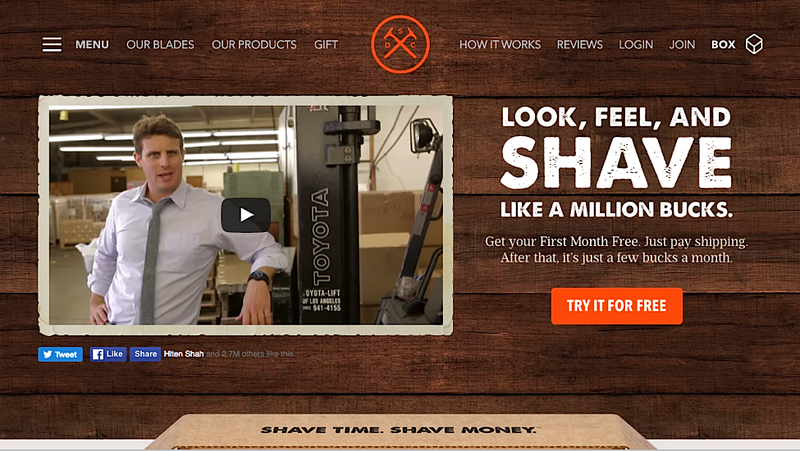 If you answered “of course,” then you obviously haven’t seen Dollar Shave Club’s now legendary launch video. DSC shook the notion of its drab, buttoned-up industry and kicked it out the window. Today, this company has over a million subscribers, its promotional video has been viewed over 24 million times, and it was recently acquired for $1 billion by Unilever. During their hyper growth, Dollar Shave Club continued to share cheeky content such as “Is It Bad to Pluck Nose Hairs with My Fingers?” and “Do I Really Need to Wash My Hands After I Pee?” These guys know how to let loose and get attention. The Lesson: Don’t be afraid to have some fun! DSC doesn’t take itself too seriously (or at all seriously, for that matter). Everything from its marketing to its onboarding, from its packaging to its social engagement is lighthearted, silly, and tongue-in-cheek. And its customers love them for it. They’ve made something as tedious as buying razors and shaving hilarious and entertaining, and that’s what stands out in people’s minds. Affiliate marketing can be a bit sleazy, but it can generate big results when done properly and genuinely. 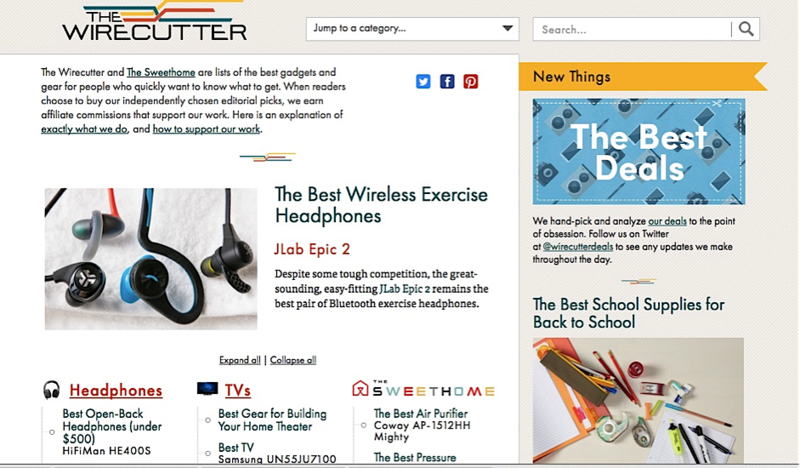 The Wirecutter has set the standard since its launch just five years ago. Labeling itself a simple “list of the best gadgets—like cameras and TVs—for people who don’t want to take a lot of time figuring out what to get,” the site generated $150 million in e-commerce transactions in 2015 and was recently acquired by the New York Times for $30 million. They write reviews for products they love, embed a link to buy it from someone like Amazon, and take a cut of each sale. Their reviews take anywhere from 20 to 200 hours to complete, involving experts and other interested parties depending on the product. It works because they’re real. The Lesson: Trust more in the power of real people. Modern consumers are wary of ads, banners, and paid search results. They want real recommendations from real people. And that’s what The Wirecutter delivers with such sparkling success. They’ve made the review (a.k.a. the “ad”) the product. People share them, like them, and rely on them to decide what to buy. The only marketing they have to do is sharing their top-notch reviews. Their fans take care of the rest. Slack is a collaboration tool that allows teams to communicate more efficiently and share files, all on one easy platform. They’ve had a pretty spectacular rise, with 15,000 users at launch in 2014, just north of 171,000 six months later, over 500,000 in less than a year, and currently sitting at roughly 5,000,000 (nearly one and a half million of which are paid accounts). Their “secret sauce” is delivering a high-quality customer experience. The company responds to 8,000 help desk tickets and up to 10,000 tweets each month. Even their Twitter feed contains a bunch of 140-character #SlackTips. The Lesson: From day one, Slack has been about selling a solution, not a product. They’ve focused on customer experience, believing that one positive experience does more than a big marketing budget could ever hope to accomplish. As their tagline says, they’re “on a mission to make your working life simpler, more pleasant, and more productive.” Make it all about solving your customer’s’ pain points. Airbnb has changed the way we travel and look for accommodations. Launched when its founders couldn’t afford their rent, the site now boasts 100 million users, 2.3 million listings, and a total valuation of $31 billion in 2017. Their marketing strategy is aimed at getting both travelers and hosts for the platform. Its digital marketing relies primarily on user-generated images and videos on Facebook, Instagram, and Twitter (highlighting the cities and properties in its stable), how-to videos and posts geared towards owners, and popular city guides. Their Instagram campaign matches humor with compelling images of different travel locations around the world, making it more than just a service—it’s a travel forum as well. When it comes to social media superstars, Airbnb shines the brightest. During a 2015 Instagram campaign, the company received 13.3 million interactions and increased followers by 341 percent. The Lesson: Create demand for your product or service by finding a topic related to your business that’s interesting. For example, Airbnb is ultimately a crowdsourced hotel business, so interesting content for them is related to travel sites around the world. Generate interest with content, and the dollars will follow. One of the biggest mistakes we see companies making when it comes to online marketing strategies is the tendency to post self-promotional materials only. Nobody wants to follow a company that can’t stop talking about itself long enough to post something of real value! 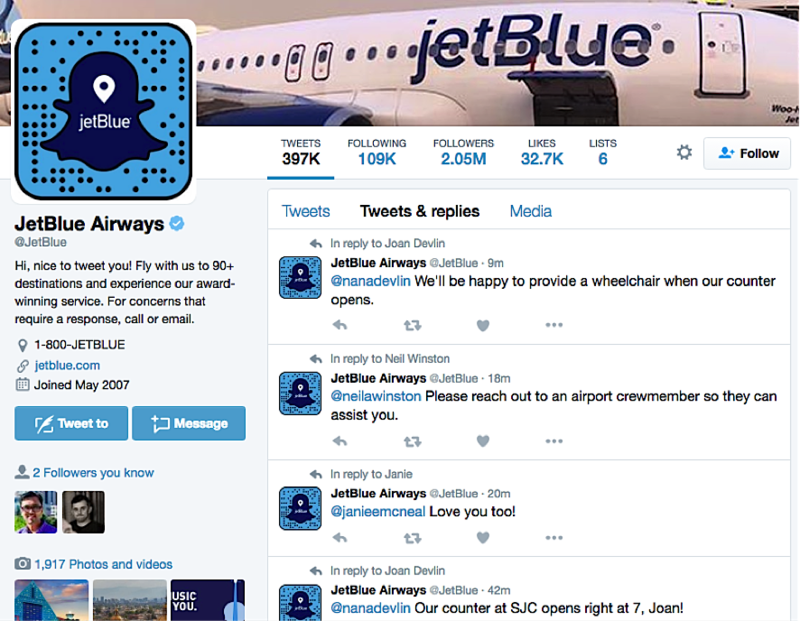 JetBlue, the popular discount airline, is one company that gets it. Instead of using Twitter to post fare discounts and special offers, the company uses its handles to provide fast and easy customer service. In fact, the effect is so profound that nearly all the messages in the company’s feed include @ replies, which is highly unusual in the world of social media marketing for businesses. The Lesson: Make it a priority to balance self-promotional materials with information that followers can actually use, and respond to users whenever they interact with your web profiles in order to boost rapport and consumer confidence. It may seem obvious now, but the idea to combine social networking and online reviews was a “Eureka!” moment for Yelp’s founders in 2004. It wasn’t that review sites were unheard of at the time, but this company approached it a little differently with the social angle. Today, Yelp has 160 million unique monthly visitors, 2.8 million claimed businesses and 121 million cumulative reviews. The social element cashed in on the “people trusting people” component that made The Wirecutter and other similar brands a success years later. Reviewers are real people, with real names and photos, and are encouraged to develop a reputation and a following. Users can even review the reviews of other reviewers! The Lesson: Keep the focus on building a trustworthy brand and a trustworthy community. 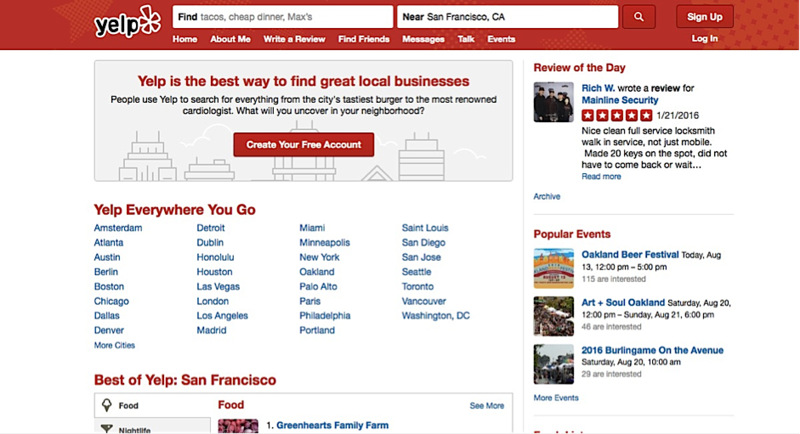 Yelp wanted to provide the best recommendations for every kind of business. To do that, they need fantastic reviewers, they need the businesses themselves to buy into the program, and they need users to believe what they read. Trust is essential, and that’s what they focused on in their early marketing efforts. Today, a one-star increase on a Yelp rating can lead to a five to nine percent increase in business revenue according to Michael Luca of the Harvard Business Review. Mastercard is the king of “Priceless” surprises. The financial services giant has a knack for creating engaging experiences that excite and retain their customers. As a major sponsor of the MLB, the company wanted to execute their “priceless” strategy and take advantage of the Chicago Cubs making the World Series for the first time in 71 years. Why? So they could be a part of history if (and when) the Cubs won. Their main objectives were to (1) connect with suffering Cubs fans and (2) insert themselves into the World Series conversation. Mastercard went out looking for the perfect way to implement their campaign and came across a great piece of content: A player on a rival team had accused Cubs fans of lacking passion for their team. This was a perfect sound bite to build an entire campaign on, so Mastercard ran with it, titling their campaign the “Sound of Priceless.” They built a sound meter and placed it around Wrigley Field to measure just how loud the fans were. After measuring the sound and learning how loud the fans truly were, they created a piece of video content around the story. In order to create the ultimate impact, Mastercard released the film online and on social media just as the Cubs won the final game of the World Series. The results were priceless. The Lesson: When you are trying to create viral digital marketing campaigns, look for content that is already out there, and put a spin on it that will benefit someone else as well as your brand. Also, notice how Mastercard was patient enough to wait until the very last game to release their content in order to maximize the reach. This is key to any great digital campaign. Timing does matter. UNIQLO is an innovative Japanese apparel company that urges the world to dress casual. Their mission is to provide simple apparel that makes your life better. The best way to do this? An effective digital marketing campaign. Uniqlo created a world-first “fast-moving” image campaign and activated it in 100 locations and online. The campaign utilizes fast moving images to deliver a unique product code which is indecipherable to the naked eye. 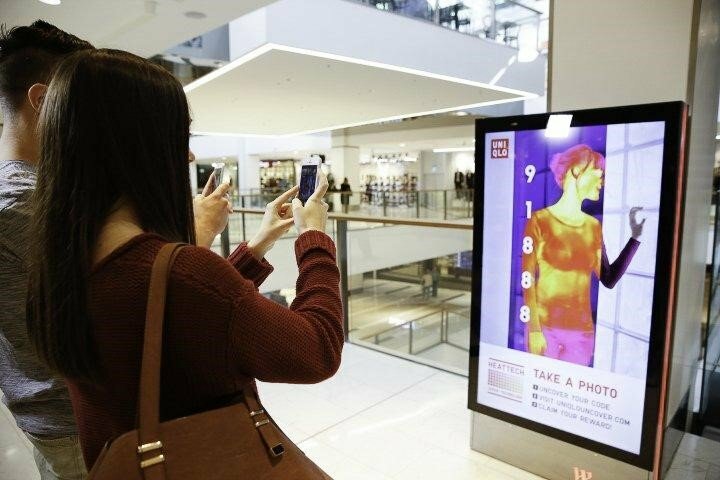 Shoppers were then asked to upload the five digit code to the campaign website to redeem a sample from the HEATTECH clothing range. Once on the site, the viewers were directed through a series of informational screens that described in detail the technology behind Uniqlo products before displaying a winning page. This experience was shareable on social and encouraged friends to uncover their own unique code through similar YouTube and Facebook videos. The results were terrific. Online videos were viewed 1.3 million times, and over 25,000 people signed up to receive the UNIQLO newsletters. In total, the campaign reached over four million people, resulting in 35,000 new customers. The Lesson: Digital marketing can be a great way to creatively engage with your customers and teach them about who you are and what your product does. By taking control of the conversation with your customer, you can create your own brand story that you want to resonate with the target customer. You don’t need to go to the lengths that Uniqlo did to interact with your customers, but you do need to take control of the conversation. This long-running BBC show attracts millions weekly to follow the adventures of the Doctor and his companions. When it comes to social media, the Time Lord eclipses all other television brands through the integration of a Tumblr blog, Twitter feed, Instagram, and a strong online presence. It’s a match made in heaven—or perhaps near Gallifrey—and a winner in our book when it comes to promoting a brand via integrated social media. The Shelter Pet Project uses Facebook to help place millions of homeless animals in danger of being destroyed simply for lack of a home. The project is a collaboration between the Humane Society of the United States and the Ad Council. Their goal? Bring the number of pets euthanized in animal shelters to zero. Nothing less than zero will do. The Porsche 911 has been the dream car of almost every American boy for over 50 years and has had a strong hold on the hearts of many car enthusiasts for multiple generations, which is why Porsche’s mobile strategy was so genius. In an age where most people utilize “wallpaper” on their homescreen more than their walls, the company aimed to reintroduce the 911 to a new, mobile-focused generation. Porsche created six Facebook Canvas ads, a new ad unit optimized for mobile, that acted as an immersive deep-dive into the specifics of six different models. The strategy was an immediate hit, ultimately racking up 15MM impressions and 2MM video views and landing the company as a finalist in the 2017 Shorty Awards. We love seeing mature companies dive into the digital marketing world with a fresh, new approach. Porsche did not disappoint. When was the last time you thought about smoking or its consequences? It’s probably been a while. That is the challenge Truth, the non-profit focused on raising awareness of the negative consequences of smoking, is constantly dealing with. In an effort to attract attention to the issue, the company launched a campaign titled #Catmegeddon. According to a spokesperson at the company, the purpose was to connect smoking to something their audience cares about as much as themselves: their pets. 65 percent of U.S. households own a pet, which equates to 79.7 million homes. Their objective was to make a cultural impact and change teens’ attitudes about smoking by broadcasting the fact that cats whose owners smoke are twice as likely to get cancer. Their strategy included paid television ads but mainly focused on “cat-sourcing” original, digital content of famous cats and cat profiles to share awareness of the #catmageddon campaign. Throughout the course of the campaign, there were 18 digital integrations on channels ranging from Vevo and Bustle to IGN and Pandora. The campaign was the most successful campaign in Truth’s history in terms of cultural impact and changing teens attitudes towards smoking, according to a company write-up for the Shorty Awards. It’s safe to say that a well-executed digital strategy that includes cat videos is bound to turn heads. Okay, so we admit it: We’re fans of the SyFy channel’s cheesy, laugh-at-the-bad-special-effects Sharknado series. We’re also fans of great Twitter use, and Sharknado 3: Oh Hell No! deserves the best-in-show award for Twitter interaction with their audience. The campaign’s goal was to make sure people were talking about the third installment in the series, and they achieved that goal big time. They create custom content that “sharkified” the event, sharing it throughout the Twitter properties linked by the network. Influencers on Twitter and Vine were also part of the campaign to spread the excitement. A “Twitter War Room” deployed during the premier of the movie also hyped the excitement. Hashtags #Aprillives and #Aprildies let fans weigh in on the fate of the main character. The campaign generated more Twitter activity than when Hillary Clinton first announced her bid for the presidency. Taco Bell’s iconic brand already dominates social media. But their mobile ordering program boosts brand recognition and helps hungry taco junkies nationwide get their fix, fast. The new app enables fast ordering right from a mobile device, and the company’s launch resulted in 300,000 app downloads the very first day—a sure sign of taco fever and a winning mobile campaign! Editor’s Note: This article first appeared on SingleGrain.